The National Library of Pakistan (Urdu:قومى کتب خانہ پاکستان), is the national and the research library located in the vicinity of the Constitutional Avenue, Islamabad, Pakistan. American author, Stuart Murray, argues that it is the oldest cultural institutional that plays a leading role in providing the resource for information— ancient and new. Established in 1950, it was originally housed in the secretariat of Ministry of Education (MoEd) and amalgamated with the Liaquat National Library (LNL); it was shifting in Islamabad in 1965 with MoEd's secretariat serving its purpose. In 1962, the Library received the right of transference of all copyrighted works to have two copies deposited of books, maps, illustrations and diagrams printed in Pakistan. It gained more significance in 1992 with the promulgation of copyright (amendment) act 1992. During the 1971 war, the library was thinned with the creation of Bangladesh with key material transferring to Bangladesh. After a period of slow growth in its reconstruction, the library began to enlarge its size and importance in the country. Development culminated in 1980s of an expensive and separated national library building within the vicinity of the Supreme Court's library. Designed with Eastern architecture, the library has space for 500 readers as well as 15 research rooms, a 450-seat auditorium, and computer and microfilm services. At its opening in 1993, the library owned a collection of 130,000 volumes and 600 manuscripts. Clauses to include electronic publications, as deposit material, are also being added to the Copyright law. The national library mission to promote literacy as well serving as a dynamic cultural and educational center for the state's capital– the Islamabad. Authorization for a national library can be traced back to 1949, although it did not gain any physical infrastructure until it was merged with the existing Liaquat Memorial Library in Karachi and renamed the Liaquat National Library. In 1967 the library began receiving copies of works published in Pakistan as part of its mandate as a copyright repository per the 1962 copyright ordinance. 1968 saw the separation of the Liaquat and National libraries, with the latter relocated to Islamabad along with Pakistan's capitol. The library was housed in a series of rented structures until construction of a permanent building was completed in 1988. The formal opening took place on 24 August 1993. Scholar Syed Jalaluddin Haider dates the library's existence later, to April 1999, when the 100,000-volume collection housed by the Department of Libraries was moved into the new building. ^ a b "National Library Of Pakistan - Resources". www.nlp.gov.pk. Retrieved 2019-03-29. ^ et. al., staff writers and constributors. 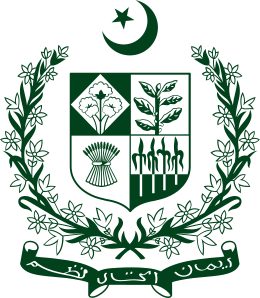 "Department of Libraries: National LIbrary of Pakistan" (PDF). Islamabad, Pakistan: National Library of Pakistan Press, PDF. Retrieved 19 August 2014. ^ Librarian of the National Library. Librarian of the National Library. Retrieved 20 August 2014. ^ a b "Address and location of the National Library of Pakistan". google maps services. Retrieved 20 August 2014. ^ a b Murray, Stuart (2012). "National Library of Pakistan". Library : an illustrated history (google books). New York: W W Norton. ISBN 9781616084530. Retrieved 20 August 2014. ^ a b c d et. al. "History of the National Library". National Library of Pakistan Press, History. Retrieved 20 August 2014. ^ a b Feather, John; Sturges, Paul, eds. (1987). "Supplement 7". International Encyclopedia of Information and Library Science. New York: Dekker. ISBN 0824720423. ^ Wedgeworth, Robert, ed. (1993). World Encyclopedia of Library and Information Services (3rd ed.). American Library Association. p. 645–646. ISBN 0-8389-0609-5. ^ a b Ahmad, Pervaiz (2007). "The National Library of Pakistan: an overview" (PDF). IFLA Journal. SAGE. 34 (1): 90–98. doi:10.1177/0340035208088578. ISSN 0340-0352. Archived from the original (PDF) on 2014-08-07. ^ Feather, John; Sturges, Paul, eds. (2003). International Encyclopedia of Information and Library Science (2nd ed.). Routledge. p. 596. ISBN 0-415-25901-0. ^ Muhammad Waris, Bhatti. 2014. "National Library of Pakistan as Legal Depository." Pakistan Library & Information Science Journal 45, no. 1: 18-23. ^ Haider, Syed Jalaluddin; Mahmood, Khalid (2007). "MPhil and PhD library and information science research in Pakistan: an evaluation". Library Review. 56 (5): 407–417. doi:10.1108/00242530710750590.